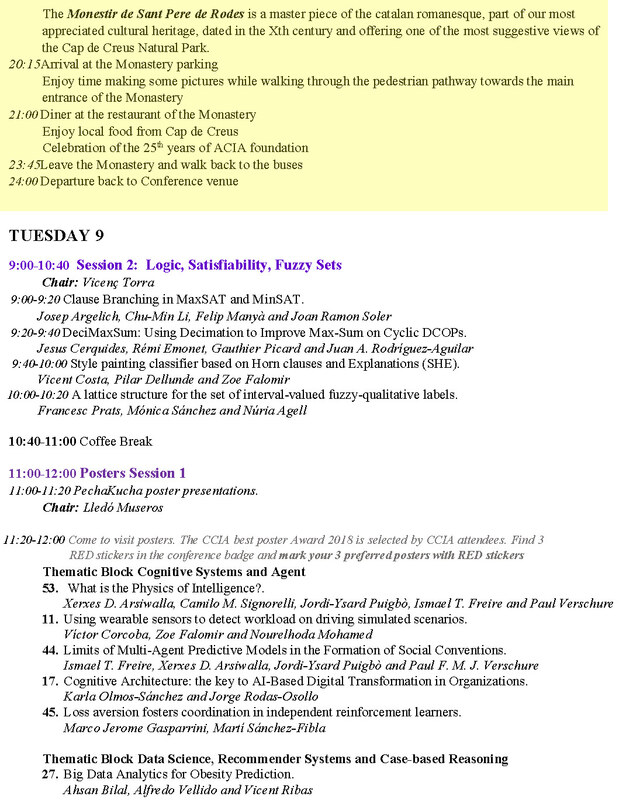 Please find details about the conference programme in this tab. Abstract. Big data is trendy, but there are any possible interpretations of its real impact, as well as the opportunities, risks and technological challenges. We will start with two key questions: can a company use big data? If so, should it? The opportunities are clear, while the challenges are many, including scalability, bias, and privacy on the problem side, as well as transparency, explainability, and ethics on the machine learning side. So we perform an analysis that includes all the data pipeline process. 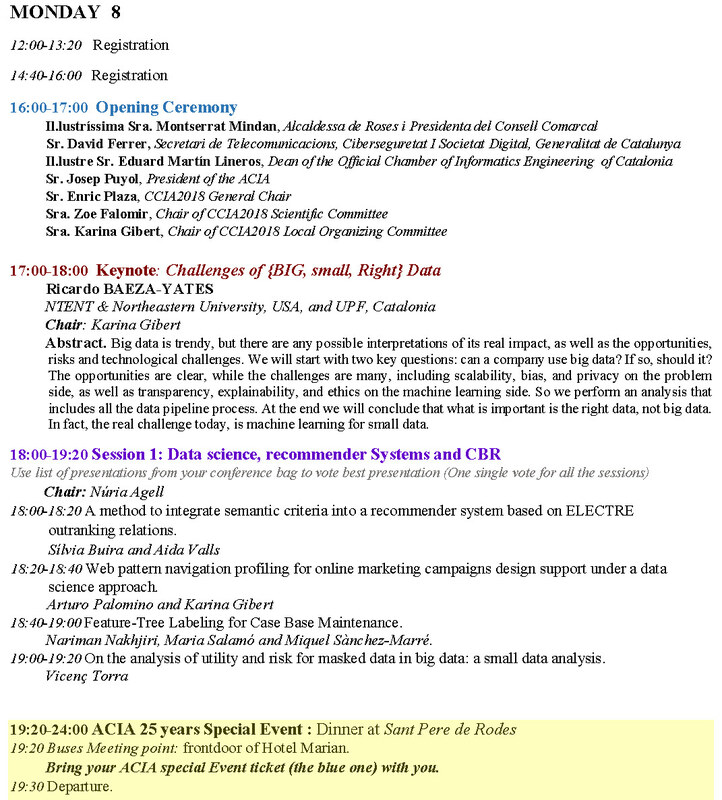 At the end we will conclude that what is important is the right data, not big data. In fact, the real challenge today, is machine learning for small data. Abstract. Everyday spatial problems such as tying shoelaces, untangling cables, locating objects, opening doors, matching shapes, finding routes, solving puzzles, ... are embedded in 3-dimensional physical space and their solutions need to be manifested in physical space. Such problems can be solved either directly in space by means of perception and manipulation or they can be transformed into abstract representations in order to be solved by reasoning or computation and subsequently transformed back into physical space. In my contribution I will compare the two approaches and I will discuss how they can be combined. I will introduce the notion of mild abstraction as a way of combining the best features of both worlds, present a variety of forms of mild abstraction, demonstrate their uses for spatial problem solving, and propose that mild abstraction can be exploited for non-spatial domains, as well. What needs to be done to ensure the ethical use of AI? Abstract. It is now clear to even the greatest doubters that AI is a powerful technology with considerable practical usage. But it has also become clear that this usage can be both positive and negative. AI can improve healthcare, aid environmental monitoring, support community formation, make culture more widely accessible, and do many other good things - always in combination of course with other digital technologies. But AI can also play a role in deceit and manipulation of public opinion, stoking societal divisions, enforcing senseless bureaucracy, cyberattacks, autonomous weapons, job loss, etc. Moreover the application and promises of AI appear to be premature in the face of autonomous cars going through red traffic lights, unacceptable decisions on granting parole, perpetuation of racial and gender bias in recruitment, etc. 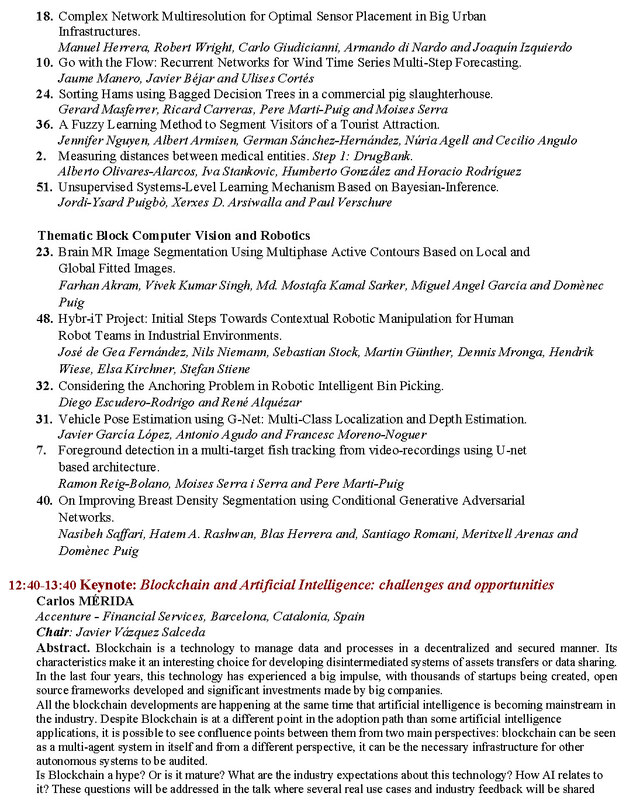 This discussion paper provides some ideas to foster positive uses of AI and guard us against negative ones, building further on the ’Barcelona Declaration for the Proper Development and Use of AI in Europe’, which you can read and sign here: http://www.iiia.csic.es/barcelonadeclaration/. Abstract. Blockchain is a technology to manage data and processes in a decentralized and secured manner. Its characteristics make it an interesting choice for developing disintermediated systems of assets transfers or data sharing. In the last four years, this technology has experienced a big impulse, with thousands of startups being created, open source frameworks developed and significant investments made by big companies. All the blockchain developments are happening at the same time that artificial intelligence is becoming mainstream in the industry. Despite Blockchain is at a different point in the adoption path than some artificial intelligence applications, it is possible to see confluence points between them from two main perspectives: blockchain can be seen as a multi-agent system in itself and from a different perspective, it can be the necessary infrastructure for other autonomous systems to be audited. Is Blockchain a hype? Or is it mature? What are the industry expectations about this technology? How AI relates to it? These questions will be addressed in the talk where several real use cases and industry feedback will be shared. 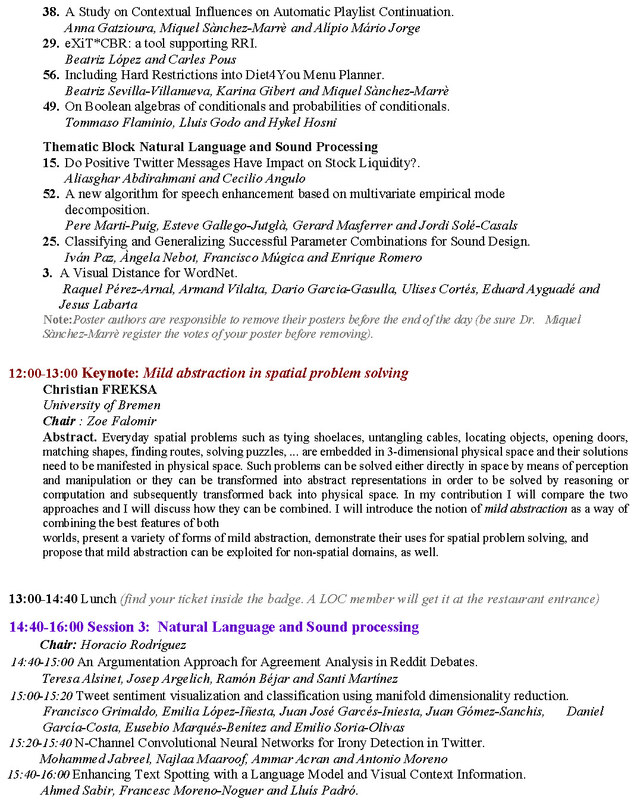 The contributed papers are grouped along thematic sessions and organized in oral presentations or posters. Clause Branching in MaxSAT and MinSAT. DeciMaxSum: Using Decimation to Improve Max-Sum on Cyclic DCOPs. Style painting classifier based on Horn clauses and Explanations (SHE). A lattice structure for the set of interval-valued fuzzy-qualitative labels. The Effect of Space-Time Representation Learning in Predicting People’s Next Location. Abdulrahman Al-Molegi and Antoni Martínez Ballesté. E. Ulises Moya-Sánchez, Sebastian Colores, Abraham Sánchez and Ulises Cortés. Towards a Universal Neural Network Encoder for Time Series. Determining Classic versus Modern Style in Fashion. Javier Tauste, Miguel Angel González, Lledó Museros, Ismael Sanz, Dolores Llidó and Luis Gonzalez-Abril. A method to integrate semantic criteria into a recommender system based on ELECTRE outranking relations. Web pattern navigation profiling for online marketing campaigns design support under a data science approach. Feature-Tree Labeling for Case Base Maintenance. On the analysis of utility and risk for masked data in big data: a small data analysis. An Argumentation Approach for Agreement Analysis in Reddit Debates. Tweet sentiment visualization and classification using manifold dimensionality reduction. N-Channel Convolutional Neural Networks for Irony Detection in Twitter. Enhancing Text Spotting with a Language Model and Visual Context Information. Ahmed Sabir, Francesc Moreno-Noguer and Lluís Padró. CuisineNet: Food Attributes Classification using Multi-scale Convolution Network. Retinal Optic Disc Segmentation using Conditional Generative Adversarial Network. An approach to Gait Analysis from Human-Rollator Interaction: The i-Walker. 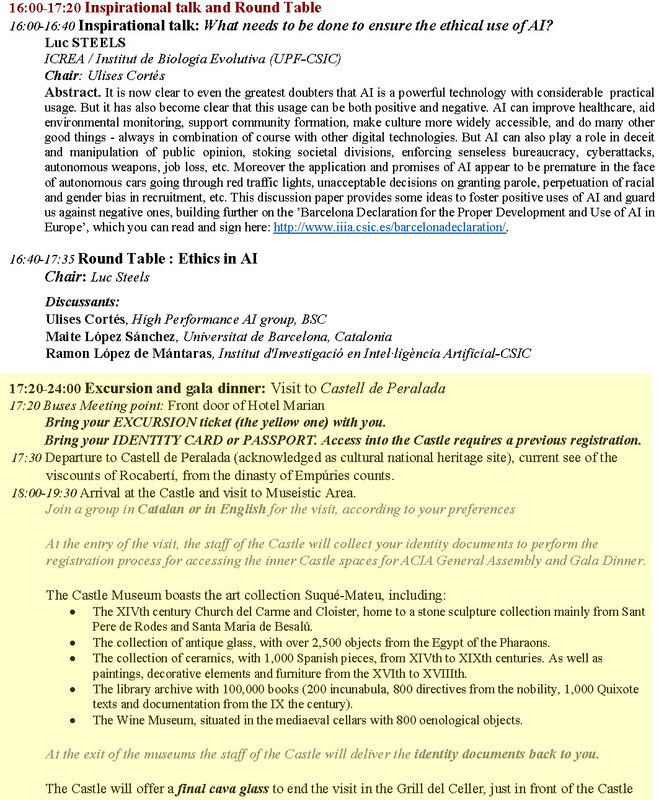 Sentient Embodied Conversational Agents: Architecture and Evaluation. What is the Physics of Intelligence?. Using wearable sensors to detect workload on driving simulated scenarios. Limits of Multi-Agent Predictive Models in the Formation of Social Conventions. Cognitive Architecture: the key to AI-Based Digital Transformation in Organizations. Loss aversion fosters coordination in independent reinforcement learners. Big Data Analytics for Obesity Prediction. A Study on Contextual Influences on Automatic Playlist Continuation. eXiT*CBR: a tool supporting RRI. Including Hard Restrictions into Diet4You Menu Planner. On Boolean algebras of conditionals and probabilities of conditionals. Do Positive Twitter Messages Have Impact on Stock Liquidity?. A new algorithm for speech enhancement based on multivariate empirical mode decomposition. Classifying and Generalizing Successful Parameter Combinations for Sound Design. A Visual Distance for WordNet. Towards Detecting Structures in Computational Astrophysics Plasma Simulations: using Machine Learning for Shock Front Classification. Complex Network Multiresolution for Optimal Sensor Placement in Big Urban Infrastructures. Go with the Flow: Recurrent Networks for Wind Time Series Multi-Step Forecasting. Sorting Hams using Bagged Decision Trees in a commercial pig slaughterhouse. 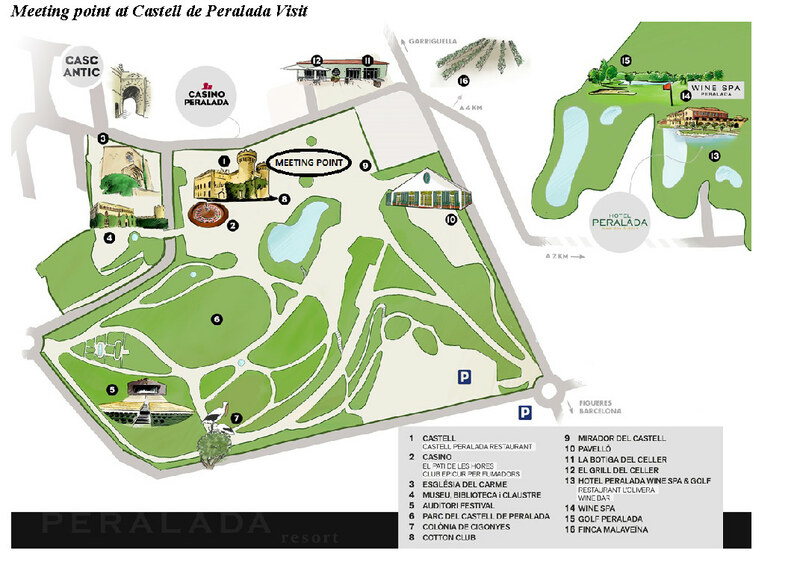 A Fuzzy Learning Method to Segment Visitors of a Tourist Attraction. Measuring distances between medical entities. Step 1: DrugBank. Unsupervised Systems-Level Learning Mechanism Based on Bayesian-Inference. Brain MR Image Segmentation Using Multiphase Active Contours Based on Local and Global Fitted Images. Hybr-iT Project: Initial Steps Towards Contextual Robotic Manipulation for Human-Robot Teams in Industrial Environments. Considering the Anchoring Problem in Robotic Intelligent Bin Picking. Vehicle Pose Estimation using G-Net: Multi-Class Localization and Depth Estimation. Foreground detection in a multi-target fish tracking from video-recordings using U-net based architecture. On Improving Breast Density Segmentation using Conditional Generative Adversarial Networks. Download the complete list of contributed papers here. Please contact your chairman before your session and upload the presentation in advance to avoid unnecessary delays during your sessions. 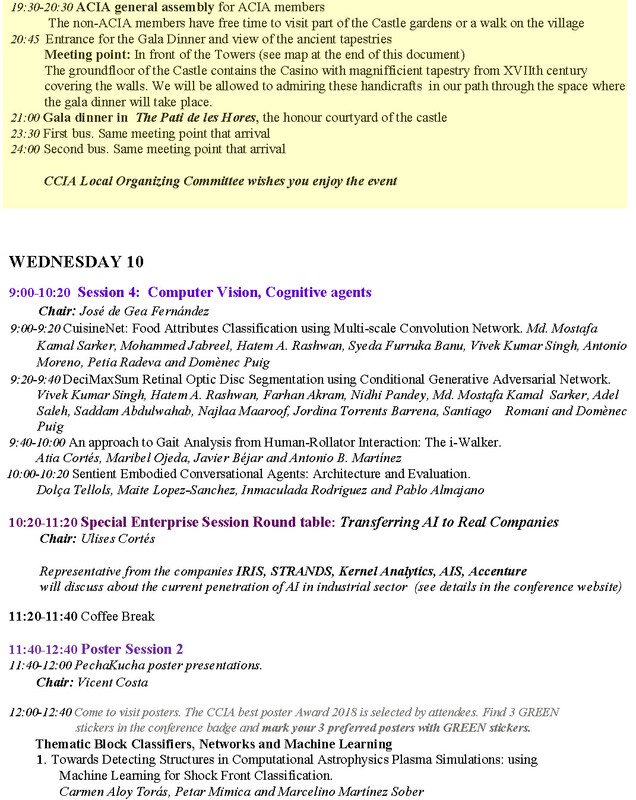 In CCIA 2018, there are two poster sessions scheduled by Tuesday 9th 11:00-12:00 and Friday 10th 11:40-12:40. In List of Contributions section Posters, you will find the session of your poster and a thematic block, and the number used to identify your poster. 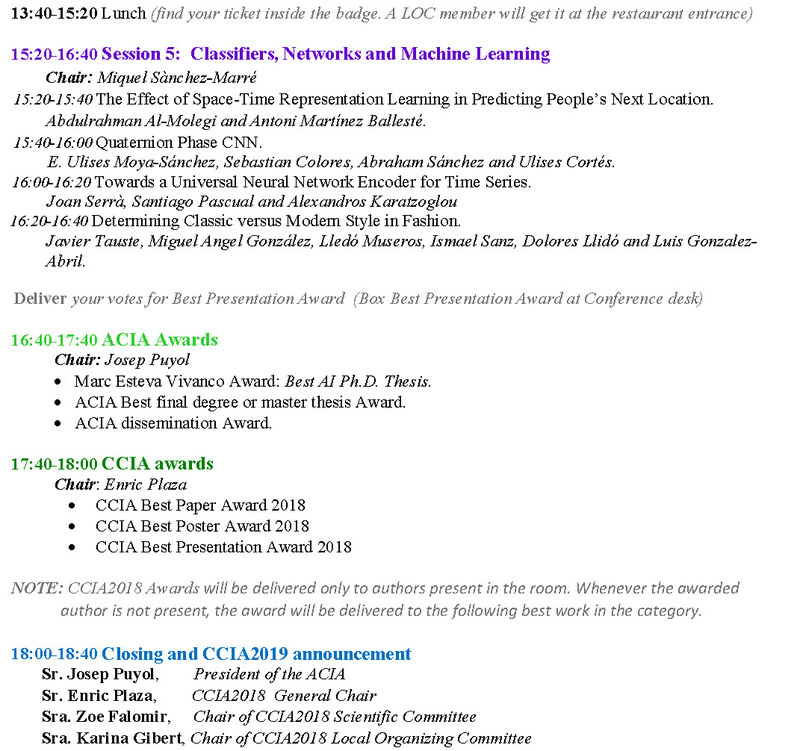 Contact your poster chairman before September 30th and send a ppt presentation consisting in 3 slides of 30 seconds each with a total duration of 90 seconds per author to be linked together in a PechaKucha-like presentation. The first slide must contain the title of the work and the author’s names and affiliations. Your poster chairman will link all presentations and include slides indicating the thematic blocs. The poster size should be no larger than A0 size (1189 x 841 mm), portrait layout. The conference room will have space in the walls for hanging the posters. The posters area will be conveniently labelled with the title of your assigned thematic block and the number of your poster. You can hang your poster either after the sessions of the previous day, or before 9:00 o’clock on the day of your poster session or during the coffee break previous to your poster session. A member of the Local Committee will provide scotch to you and help if required. The poster session will start with the brief oral presentations of all the posters in the session in which each of you can make a briefing of your work giving a clear and concise idea about the goal of the work and the results/contributions achieved. After the presentations, move in front of your poster to attend questions of attendees. Remove your posters at the end of the day. Before removing your poster, be sure that Dr. Miquel Sànchez Marrè has come to register the votes of your poster for the best Poster Award before removing. 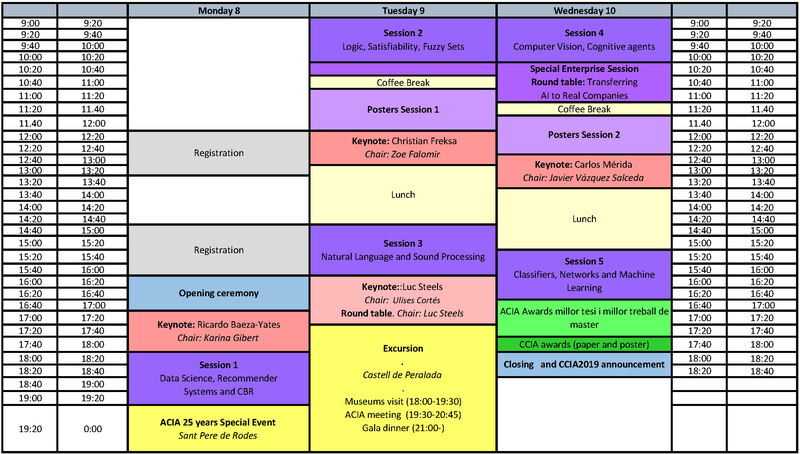 Download the detailed programme here.